A couple months ago, tishalook ran an official Marapets Clothing Design Contest on the Graphics Forum and the entries we received were so good, we decided to create a permanent Fashion Show feature in Lowlyhood. If you have an idea for new character clothing on Marapets, enter and make your ideas a reality! Simply draw your ideas onto one of our Male and Female bases and email it to us. You can even print it off and design it by hand, scan or take a photo of it and then email it to us. Then everytime that we receive enough entries, we will pick winners and our artists will create them for the site. Lucky winners will be released in the news, win 100,000MP, a Fashion Show Medal for their profile, receive a set of the items they helped to design and be permanently added to the Fashion Show winners gallery! Congratulations to our first Fashion Show Winners - Decomposition, sassygrl93731174, gregoentre, Sorci, Anatidaephobia, GERARDWAYmcr, lolalex, Angrybunny, mumu35, lolalex, Reichenbach, JahLove and Toyboks! You can now view their entries at the Fashion Show page in Lowlyhood. The items that they helped to design have been added to the Vending Machine. A new Weekly Quest Challenge has just started. This week's quest game is Farming. The challenge is to complete as many of these Quests this week. The top 3 players at the end of the challenge will receive a Pilgrim Costume, 200,000MP and a Gold Trophy, the next 6 players will receive 150,000MP and a Silver Trophy and the next 9 players will receive 100,000MP and a Bronze Trophy. The Newths and the Ziranek geeks have been working day and night to find a patch to the computer virus in Ziranek. A newer, more upgraded version of Ziranek will be ready this Friday - virus free! This means that you all have until Friday, April 18th for this event to finish. The Computer Parts store has been revamped and to help you complete more Snowman quests during this event, it is now restocking more items! All Corrupt items from this event will retire on Friday at the end of this event. Can you find the 'Corrupted' Hidden Avatar? The Easter Bunny has made her debut appearance in Marada! Decorate your profile and dress up your character for the celebrations, in pinks and golds and purples. 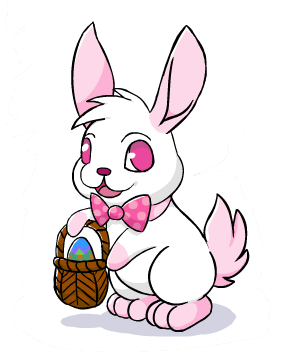 The Easter Bunny will be visiting profiles and you may get rewarded for those who impress her. The Easter Bunny is not like Beelzebub, she is shy and easily scared away! Be nice and she will be running contests, games and giveaways on the Forums - a few lucky winners will receive a retired Lati Potion or Easter Costume, retired Easter Eggs and other great items! Naughty players will scare her away or receive only Carrots. Want to help out? - send us items to the account 'Easter Bunny' for us to use as prizes! A reminder that the annual Easter Egg Hunt will be starting later this week. This year will be better than ever, with a special suprise in store for all of those who find all 40 Easter Eggs and complete the hunt. Don't miss out! Can you find the 'Hoppy Easter' Hidden Avatar? The Giftbox items on the Account Upgrades page have been improved. Every Giftbox item has been revamped and they are all now on sale in a brand new Giftbox Shop. Every single Giftbox has had their item description updated, so there should be no more confusion over what each one does! The most confusing 'Transmogrification Time Giftbox' has been renamed to 'Transmogrification Repeat Giftbox' and before you buy in the shop, a pop-up confirmation alert now asks you to confirm your purchase to stop accidental buys! There is also a 'what does this do?' link for each Giftbox so you can easily see what each one is for. Finally, once you have used a Giftbox, the boxes telling you about them will be removed from those sections of the site. For example, the Double Crystals Giftbox message will be removed from Elger quests page once you have used one. The Giftbox section of every player's profile has been updated. They are now organised alphabetically, link back to the Giftbox Shop and has a progress bar of how many you have collected. The Account Upgrades page has been updated with new links to the Giftbox Shop, Account Upgrades Shop and the Monthly Checklist - where you can win Account Upgrades credits for FREE each month. Yes, we will remove the 15,000MP entry fee next month so it is actually FREE to enter! The limited edition Account Upgrade items section is now a new Shop. This will make it easier and faster for us to release new items for sale. It also now has a pop-up confirmation alert to stop accidental purchases. Items will also automatically retire, at midnight, on the date items in the shop say that they will retire. For a limited time only, this shop now has random pieces of the Vending Machine Instructions and Sumo Sally Pass for sale. The Sumo Sally pass will automatically retire May 15th and the Steampunk Treasure Chest will automatically retire April 25th. A new Weekly Battle Challenge has just started. This week's opponent is Hasani, you will need to have a Hasani Trading Card in your Battle Deck. The challenge is to win as many battles against this opponent this week. The top 3 players at the end of the challenge will receive a Gargoyle Trading Card, 200,000MP and a Gold Trophy, the next 6 players will receive 150,000MP and a Silver Trophy and the next 9 players will receive 100,000MP and a Bronze Trophy. The Lottery has been drawn for this week. JadeDragonLady is the winner of the 45,100MP Jackpot with the winning numbers of 12, 6, 23, 21, 9 and 3! Congratulations! Last Week's Raffle has now ended. hpcybrcn is the winner of the Red DNA and 100,000MP prize with the winning raffle ticket number 5251! Congratulations! Make sure you buy your tickets for today's raffle - only 10MP per ticket! Breaking news from Biala! The computer virus that hit the city of Ziranek has been spreading around Marada! Items restocked recently for FREE in Ziranek were infected and spread around Marada by the Snowman quests. The Snowman has become corrupted and is now asking for Computer Parts to be sent to players online, to replace their infected parts. Until a patch is found for Ziranek, the snowman may reward you with these Corrupt items. A hacker from Enpiah has managed to spread a computer virus in Ziranek. Once a world filled with the latest technology, in recent years has become dated and unprotected. All pets of Marada are being advised to stay away from this world until the Newths find a way to fix the damage these Huthiq hackers have caused. But for those willing to risk it, all Shops in Ziranek are now FREE. You can now buy items from the Appliances, Batteries, Computer Parts, CDs, DVDs and Glowing Eggs shops for 0MP until further notice. Each player can buy one item from a Ziranek shop every 5 minutes. Just a reminder that Easter Sunday is April 20th and our annual Easter Egg Hunt will start next week. Don't miss out! The Snowman in Biala has been redrawn. We hope you like the changes! There are 4 new Seeds restocking to grow these 4 new Organic Minipets. A new Weekly Quest Challenge has just started. This week's quest game is Candy Tree. The challenge is to complete as many of these Quests this week. The top 3 players at the end of the challenge will receive a Geek Costume, 200,000MP and a Gold Trophy, the next 6 players will receive 150,000MP and a Silver Trophy and the next 9 players will receive 100,000MP and a Bronze Trophy. A new Weekly Battle Challenge has just started. This week's opponent is Mechanic, you will need to have a Mechanic Trading Card in your Battle Deck. The challenge is to win as many battles against this opponent this week. The top 3 players at the end of the challenge will receive a Explosive Trading Card, 200,000MP and a Gold Trophy, the next 6 players will receive 150,000MP and a Silver Trophy and the next 9 players will receive 100,000MP and a Bronze Trophy. The Lottery has been drawn for this week. ather is the winner of the 53,400MP Jackpot with the winning numbers of 1, 12, 19, 23, 16 and 7! Congratulations! Last Week's Raffle has now ended. HarryPotterRulz1995 is the winner of the Red DNA and 100,000MP prize with the winning raffle ticket number 2948! Congratulations! Make sure you buy your tickets for today's raffle - only 10MP per ticket! The Forums have been updated. They now have a new layout and new icons. We hope you like the changes! These new items have been added to the Recycling Centre. The default Zola avatar has been released. A new Weekly Quest Challenge has just started. This week's quest game is Kamilah Traveller. The challenge is to complete as many of these Quests this week. The top 3 players at the end of the challenge will receive a Sleepy Costume, 200,000MP and a Gold Trophy, the next 6 players will receive 150,000MP and a Silver Trophy and the next 9 players will receive 100,000MP and a Bronze Trophy. The March 2014 Monthly Checklist winners have been announced and the prizes have been rewarded. Congratulations to all of those who have won. Don't forget, this is a monthly permanent feature that you can enter for FREE. If you haven't already, you should start entering the April event! NOTICE - this news was an April Fool's Day joke and is not a real event. 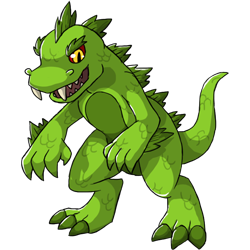 It has been a week since the Pot of Gold event where Zetzilla ate all 1,001,605 items that were donated. He was so full that he has stayed quiet since. Now it seems all of those Baby Costumes he ate have given him the taste for pets too! He has randomly been biting the heads off of your pets. For the next 7 days, you need to search Marapets for the missing pet heads. Just like the pumpkin hunt, these heads will randomly show up on the page. The more heads that you find, the more prizes you will win. At the end of the event, if every missing head is found, your pets will return to normal! The top 100 players who find the most pet heads will receive a Headless Costume and 1,000,000MP! There are now 11 new Headless Pets. Basil, Daisy, Echlin, Hump, Kujo, Lorius, Pucu, Willa, Xoi, Zola and Zoosh. A new Weekly Battle Challenge has just started. This week's opponent is Boo, you will need to have a Boo Trading Card in your Battle Deck. The challenge is to win as many battles against this opponent this week. The top 3 players at the end of the challenge will receive a Hero Trading Card, 200,000MP and a Gold Trophy, the next 6 players will receive 150,000MP and a Silver Trophy and the next 9 players will receive 100,000MP and a Bronze Trophy. The Recycling Centre in the City of Marada has been redrawn. There are also new items now on sale. These new Recycled Pets have been released. The Rofling, Viotto and Snookle are redraws and the Leido is new. The Lottery has been drawn for this week. LilyahnaDamien is the winner of the 84,800MP Jackpot with the winning numbers of 23, 6, 21, 8, 18 and 22! Congratulations! Last Week's Raffle has now ended. vivia is the winner of the Red DNA and 100,000MP prize with the winning raffle ticket number 3203! Congratulations! Make sure you buy your tickets for today's raffle - only 10MP per ticket! A new Capsule Machine has opened in Nimbus. It is filled with special Capsules containing many rare and exciting items. Insert a Capsule Machine Token and you will receive a random item. You can use it once every 12 hours. If you are really lucky, you may win a restricted Zola pet! The Capsule Machine Tokens are avaliable at the Account Upgrades page. 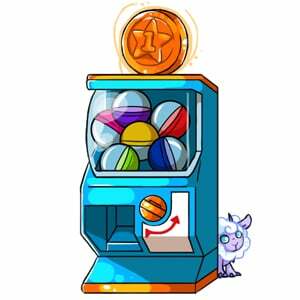 As the Capsule Machine can only used once every 12 hours you cannot send Tokens to other players to use the Capsule Machine on your behalf and to send you the item they win. That is putting your account at an unfair advantage over other players and is not permitted. The Zola can now wear the Baby Costume. We have just released a new Goals Game. At every level you have a new goal to complete related to the City of Marada. Each level gets harder to complete but you will receive a prize for completing each level. Unlike quest and mission games, you have unlimited amount of time to complete each goal level and you can only complete them once. New levels will always be added to the Goals in each world. Prizes include rare items only avaliable from goals, MP, BP, RP, Dukka Coins, Account Upgrade Credit and stats for your pets. The City of Marada Goals is the 16th world to have goals and currently has 31 levels for you to complete. New levels will be added in the news to these goals all of the time, each with a brand new prize. The City of Marada Goals has been added to the City of Marada map. The Monthly Checklist has been updated. The requirements have changed and the artwork has been improved. You may also randomly win a Capsule Machine Token each month when you enter. Remember, if you have the Monthly Checklist Giftbox you will automatically be entered twice, each and every month, for life! There are just a couple of days left to enter the March 2014 competition so if you haven't already entered, enter now to win Account Upgrades Credit! NOTICE - the new requirements will NOT need to be completed this month. If you are entering this month, ignore the Plates & Plushie collection requirement until April. The Security Codes around the site have been improved. They should be much easier to read now!